Kids' Book Review: Introducing--our new Managing Editor! KBR is absolutely thrilled to introduce you to our brand new Managing Editor, Dimity Powell, who will be perching on her editorship chair from 1 February 2017. I have known Dimity for many years now. She is a valued industry player in our burgeoning Australian children's book industry, and is the perfect choice to take the reins of KBR as it gallops into a fresh new phase. An author, app creator, festival and conference presenter, valued reporter and media coordinator for SCBWI Queensland, blogger, longtime reviewer for Boomerang Books and sunny Queensland gal, Dimity's experience and passion will quickly become apparent on our site. We hope you'll join us in welcoming Dimity to a fabulous new page header in the chapter book that is KBR, and the entire team looks forward to bringing you many more years of sensational children's book content from Australia and around the world. Read more about our current team right here. Dimity experienced her first literary epiphany in the girls’ washroom at school, aged six. While bending over the stainless steel troughs, the conviction that books held the answers to any question she may ask washed powerfully over her. Since then, books have been her most earnest and loyal companions. After reading dozens of them, she set out to find more and has since trekked through many parts of the world and across several of its oceans collecting crazy story ideas. She loves transforming these into stories for children because secretly, she would love to be one again, with license to curl up with a book all day. To support this fantasy she produces sometimes silly, sometimes sad, always sparkly stories, which she hopes resonate integrity and above all enthral young readers. Dimity considered herself a ‘bridesmaid author’ for a very long time, always shortlisted rather than spotlighted. That was until people started asking for her word-webs to include in anthologies, junior novels, school magazines, picture books, and even as digital apps, one of which, The Chapel of Unlove for Story City was Shortlisted for the WA Premier’s Books Awards 2016. 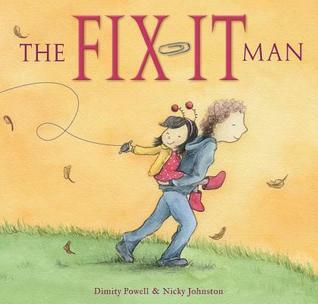 The Fix-It Man is her debut picture book (illustrated by Nicky Johnston) with EK Books with another to follow in 2018. This makes her happier than a bear eating ice cream. These days, she is able to celebrate more competition wins, which encourages the excuse to eat even more ice cream. Dimity thrives on delivering more than expected, accepting challenges she has to stand on tippy toes to reach, and celebrating the profound art of story. She fervently believes that stories create the breath that keeps the world spinning and is a devoted advocate for children’s literature, facilitating writing workshops for children and adults, reviewing as many ‘must-share’ titles as she can online and pops up from time to time to assist the various associations she’s affiliated with such as SCBWI and Book Links QLD. Despite her inability to manipulate a smart phone, her most successful recent appointment was overseeing a crew of Roving Reporters as the National Media Coordinator for the SCWBI Sydney 2016 Conference. Dimity’s past adventures include skiing in the French Alps, Kombiing around a quarter of Australia and getting lost in the Bermuda Triangle. She’s tried a few grown up jobs but is now fully occupied with workshopping ideas on how to spend the tens of tens of dollars she makes as a children’s author. One day, she would love to make it to Lapland and meet Santa Claus for real because believing in the magic of Christmas is something she’s never been able to truly forsake. Dimity lives just around the corner from Bat Man on the Gold Coast in Australia but both are far too busy to hang out much together. Fantastic choice. Thanks for sharing Tania and congratulations Dimity. Many thanks Cecilia. I look forward to doing all at KBR proud. How wonderful!!! Huge congrats Dimity. We will hopefully meet you at the Fix It Man launch. Oooh Jambo, that would be fantastic. Please do say hello! Brilliant news, Dimity and Tania. I've known Dimity as well for a lot of years too, in SCBWI Qld where she has been an enthusiastic supportive member on our team. I was confident to hand on the reins of the SCBAI Conference blogging job. She carried it out with aplomb, with efficiently, humour and with great care and consideration for others. Aw shucks Ms Gwyther, you do make a gal blush! I hope I can continue to reach those ever increasing bars, but yes, can't wait to have more fun - how can one not surrounded by all these marvellous books and people who love sharing them as much as I! Thanks and ever thanks, Jo! !